Like new in original box with LWB; deck never used. Box has slight shelf wear. Since its inception over 100 years ago, the Hermetic Order of the Golden Dawn has continued to be the authority on the initiatory and meditative teachings of the Tarot. This Tarot incorporates all of the temple symbolism needed for use in the Golden Dawn rituals. 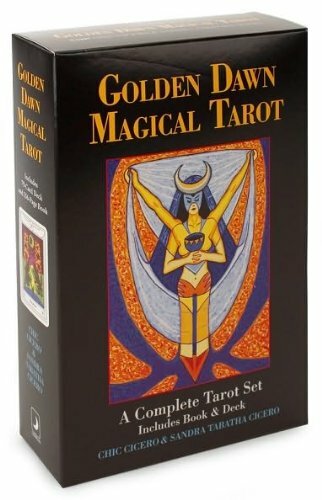 Created at the behest of the renowned occultist and father of the modern Golden Dawn movement Israel Regardie, this stunning deck masterfully blends traditional Tarot imagery with descriptions from the Golden Dawn initiation ceremonies. 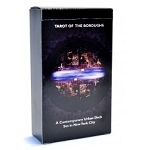 This is the first Tarot deck to incorporate the symbolism necessary for use in rituals. Written and created by internationally known adepts Chic Cicero and Sandra Tabatha Cicero, this is ideal for the beginning student but equally appealing to expert Tarot readers. The accompanying book provides an introduction to Cabalistic, Zodiacal and Alchemical symbolism creating a powerful tool for divination and spiritual growth. Complete with 256-page book and two versions of the Temperance card_as required in Golden Dawn rituals_this is the best Tarot available for students of the Golden Dawn and the Western magical tradition.